Within the next few weeks, Microsoft will be releasing the new generation model of its successful laptop for professionals, the Surface Pro 4. Having been using the Surface Pro 3 since it came out, I have taken it all over – from the dusty Race Track playa of Death Valley to the red sands of Wadi Rum in Jordan. Being light and portable, it has been in my camera bag pretty much everywhere I go. I have always been a PC guy (although I recently bought an iMac), so I have had quite a bit of experience using all kinds of PCs for my needs. And although I have never had issues with PCs, my biggest struggle has always been laptops. Having tried everything from expensive Dell Precision models to lightweight ultrabooks, I pretty much hated them all for one reason – the amount of heat they generate, particularly when using them on my lap. Overtime, I had to find various solutions to make it comfortable to work – I started out with a few different kinds of boards with built-in USB fans and ended up with small tray tables that would accommodate those laptops. And the larger the laptop was, the more ridiculous the solutions were getting. The idea of using a workstation-class laptop as a primary machine faded away over the years, as I was not particularly interested in carrying a monstrous and heavy laptop anymore. Then I tried out the iPad, which at first sounded like a good idea. But aside from reading emails and browsing the web, it turned out to be a joke (and still is, including the new iPad Pro) for any serious needs. No USB ports, no mouse, no full version of Lightroom or Photoshop. No, thanks! I then ventured on to ultrabooks and tried a few Dell XPS, HP, Sony and Acer models. They were certainly better for travel, but they were still designed as the good old laptops, making them terrible lap buddies. Still the same issues with heat generation, even those with carbon fiber chassis and special heat dissipation vents. Some would need periodic dis-assembly and cleaning of vents, or they would slow down to a crawl. And then one day I saw the Surface Pro 2. After playing with it for a few minutes at a local Best Buy store, I decided to give it a try. I was instantly in love! No more lap heat, silent operation – all in a very compact and lightweight package. And best of all, no custom crippled operating systems! The thing ran a full version of Windows, which meant that I could run anything I wanted on it. After a month-long trip to England with the Surface Pro 2, I was blown away – I wrote my thoughts in a detailed review of Surface Pro 2 back then. And then came the Surface Pro 3, which was even faster and more capable than its predecessor, particularly for running Photoshop and Lightroom. I ended up upgrading to a higher-end Core i7 version, which was a great decision that I certainly have no regrets for, since the Surface Pro 3 has been my companion for not only travel, but also working from home. After using the machine for a while, we shared our happy thoughts in our detailed review of the Surface Pro 3. Being a touch-screen display, I have also been spoiled by the fact that I can just grab the screen and use my fingers to click on things or navigate through websites. I don’t have to think about using the touchpad all the time or an external mouse! I got so used to doing it, that sometimes I find myself accidentally touching my monitor on my workstation PC and wondering why it is not responding. If you have been on a quest to find a solid machine for your photography needs with a great balance of performance and features vs weight and size, check out Microsoft’s Surface Pro, particularly the upcoming fourth generation model, which is supposed to be released sometime next week. If Microsoft uses Intel’s Skylake architecture, 16 GB of RAM and a much faster GPU (these are the rumored specs), it could become the next dream machine for many photographers, including myself. I am pretty happy with what I can do on my Surface Pro 3, but Adobe’s apps can be pretty demanding in terms of processing power and memory usage, so faster performance would certainly be a good reason to consider upgrading. The Surface is a very interesting machine, because it kind of reminds me of an Apple MacBook in some ways. MacBooks have been praised for years for being very stable, reliable laptops and one of the reasons in my opinion has been software and driver support – using a limited number of hardware parts is always easier in terms of support and you don’t deal with stability issues. Microsoft’s Surface does exactly the same, since Microsoft delivers all the firmware and driver updates automatically. Having been running Windows 8 and now Windows 10 on the Surface Pro 3, both have been rock stable. Didn’t have to deal with any drivers at all – everything just works out of the box, which I am sure Apple fans can relate to. Thanks Nasim, I am hoping to buy on Black Friday. WE have a department store here in UK that price matches Apple for basic models but offers a 3 year warranty as part of deal so I will weigh up options but looking forward to your opinion. I guess I will need 16gb RAM but am unclear how the fusion drive works and how important the processor and graphics cards are. Or for that matter should not worry about 3year warrant as my existing iMac is heading towards 6 years. Thanks for getting back to me and looking forward to review. I haven’t used my Wacom tablet since getting the Surface – it’s much easier to use the stylusdirectly on a screen that shows the actual image being edited rather than drawing on a Wacom pad while watching a separate screen. I’ve read that the iMac screens have limited color gamut, what’s your experience? Perhaps Mac mini + a quality monitor might be a better way to go? Well, they have to raise their game now that the iPad Pro is out. While the iPad Pro borrowed a few ideas from Surface it really upped the possibilities, too. I think Microsoft is heading in the right direction with the Surface, finally. I agree… Until you can run full versions of Lightroom and Photoshop on the IPad pro it’s just another toy…. Right now I’m running Windows 10 and full versions of Lightroom 6.1, Perfect Photo 9.5 and full MS Office Suite on my SP3… It also has 512gb and USB3…and so I can put all my RAW photos on it …and also quickly backup to an external 512gb thumb drive easily while traveling …. Really fantastic …and only going to get better with the SP4…. I really like that it is a real PC, but also a tablet in one single machine. It is probably also the most powerful PC compared to its size and weight if you get the i5 or i7 version. Great screen as well with almost full sRGB gamut. Fully agree that it is rock stable with both Windows 8 and Windows 10. One thing is certain, I’m never getting an ordinary laptop again. Anders, totally agreed! I started out with the i5 version and moved up to i7. Solid performance, definitely would be hard to even think of a laptop for me – I am done with those! I’ve been using my Surface Pro 3 since day one both personally and at work. It’s been a godsend for my productivity thanks to its power and portability. I run in through a 34″ widescreen monitor at work and then use it at home and on the road with the Type Cover. On October the 6th Microsoft will be announcing the new Surface Pro 4 which I’ll undoubtedly order. I completely agree that the main advantage of the Surface over all over PCs is the amazing support Microsoft delivers to their product. It’s constantly getting better. Ricardo, if the SP4 ships with 16 GB of RAM, faster GPU and Skylake, it will be a dream! That hasn’t been our experience. Things that run excellently on Win 7 have faltered on Win 10. Printer drivers that are operational on Win 7 won’t load under Win 10. We’ll wait for a while… probably a year or so and see if things improve? At present we just can’t afford the time/effort to debug yet another MS operating system and are certainly not going to spend a whole lot of $$$’s replacing hardware simply to get an operational Win 10 environment! Totally agree about the Surface Pro 3. Though I have mor powerful laptops and have desktop systems too i use my Surface Pro3 with adobe CC, when on the road, and anywhere portable operation favors light weight computing solutions. External USB @ 1TB for under $70.00 and you have eveything neded for portable or full time processing. 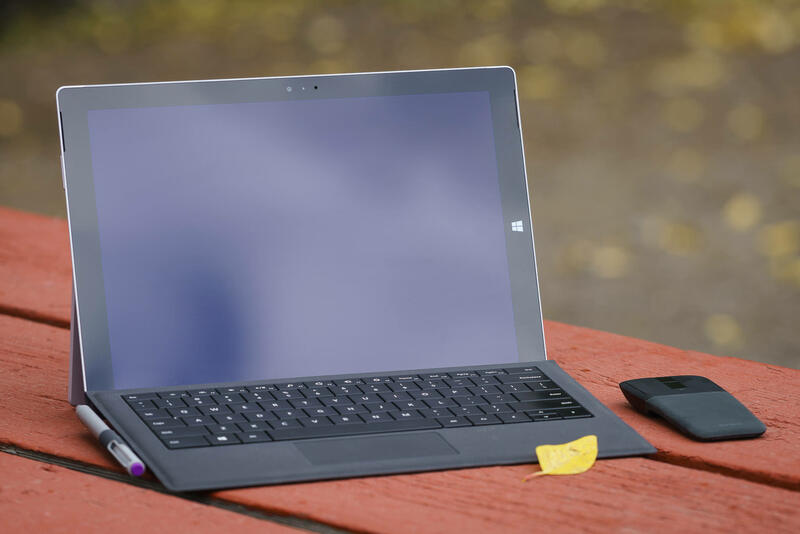 Wally, try out the Samsung T1 with the Surface Pro 3 – it screams! That’s what I use for photo storage on the road and I could not be happier. I think my Surface Pro is great for travel. It handles my Photoshop CC needs well. It is also great for storage until I get home to use the larger screen on my desktop. Love it! I moved to a Surface Pro 3 in February, ditching both iPad and laptop. I’ve used it on shoots around the world and, as you say, it really is very good. It’s particularly useful that Adobe support it with a nice interface on the high res screen and the Lightroom tablet mode is very useful for editing on the fly. As its a proper computer, I can run all my software on it, calibrate the screen with my xRite for editing and generally do all the things I want to. I really love that the stylus can be used to make selections etc in PS. I had a few glitches after switching to Windows 10, but these seem to be ironed out now. On the negative side, I would note that I have the i7 version, which is very fast but that configuration makes it more expensive than a top-end macbook pro. The battery life is somewhat short of microsoft’s claims, but at 5-6 hours it’s adequate. Now how about those IMMENSE security and privacy issues that had been so well written about in Windows 10 Nasim ? Are we just gonna pretend that those are not there ? You have not mentioned them in article nor did you do it in article about Windows 10 upgrade. Kinda odd to omit something that important don’t you think ? Immense? Hmm, think you are exaggerating just a little. Personally I have no concerns with those policy statements from Microsoft and you can disable the stuff that may make you worried. Hello Nasim. Our current set up is a MacBook Pro and multiple external hdd’s duly formatted to be compatible with the MacBook Pro. Will the SurfacePro work for us? Swati, if you are a Mac user, it is probably best to stick with Apple – that transition can be a bit difficult. Thank you Nasim. I guessed as much! ? I don’t see Apple doing anything to solve the real portability issues that photographers would have. Which is strange given that they sell themselves for their graphic capability! Maybe they are interested only in gamers? Or maybe if they stopped wanting their customers to buy a different gadget for each need they would realise that there are severe weight restirictions while travelling with photo gear. If I could figure out how to shift all my external hdd’s data from iOS to a windows platform I might still be tempted to shift! First several recent articles on this site have been really great /helpful. I loved the article on how the picture was taken. The article about what to pack for Alaska was also great. This site has always been great, but lately you have been on a roll. Now about the Surface Pro. I can hardly wait! Like you, I use a PC more than Mac. I do this because I make tons of slideshows and the software (Proshow Producer) is Windows only. I could run it in emulation, but then it’s sluggish on that fast expensive laptop. Despite that, about 10 years ago I went to Macs only for laptops. Everything was better IMO. Fewer configuration issues, great trackpads, considtent power management, great backlit keyboards, a good usable backup program as part of the OS…nothing else compared for me. So why switch to a Surface Pro? Great power in an even lighter package and it runs Proshow natively. I will be able to run everything on one system while mobile. I get practically all the advantages of the Macbook Pro plus more. It even has a nice backlit keyboard. I will pick one up early next year. I like to upgrade every 3 years and the MacBook is just over two. I know I will love it. Sceptical, I appreciate the feedback! I would certainly wait until the Surface Pro 4 is announced, it should be superb! I’m currently using a Samsng Galaxy Tab S 8″ as a portable photo album. One of the best displays I’ve ever seen, with heaps of contrast and range if/when needed. Easy to use, fast, with USB and it has a microSD to store my photos. I just have a couple of those that I plug-in as needed, depending on what I’m showing. Tremendous for video as well. And above all, cheap and with no temperature issues whatsoever. I’m delighted with my Surface. The iPad is OK for email and browsing the web, but I find it so limiting not having a ‘proper’ operating system and apps like Lightroom and Photoshop, and the lack of conventional file management. I wish I had bought a Surface sooner – I’ve only had mine about 4 months. It will be interesting to see what they do with the Surface 4. I think you meant to say you’ve been using the Surface Pro line in general, not the Surface Pro 3 specifically, which came out summer 2014? Brent, thank you for letting me know about the typo, I fixed it in the article. Fully agree with your comments re Surface Pro. I have the i5 version with 250 GB SSD storage. Excellent! Upgraded to W10 like a dream. I use it for backup when out and about. Just back from Iceland and loaded >2k images with immediate partial editing with LR 5.7. HOWEVER, I have encountered a persistent and most annoying fault. Using the keyboard for text (emails etc), some of the currently inputted text suddenly and erratically relocates to another line and inserts into an already typed part of the text. This can affect several words before I realise it, and then I have to remove the ‘moved’ text and return it to where it should be. Has anybody else encountered this problem? Tony, you are probably accidentally touching the touchpad as you type – avoid touching it and your problem with sudden placement of cursor in other areas should stop, hopefully. I have had my Surface Pro 4 for about a year. I must say, this is the best mobile device I have purchased. It is fast (including 16gb!) small, has an amazing calibrated screen, and I love the pen for Photoshop and OneNote. I like it better then my much loved MacBook Pro (2013, maxed out system). It had one serious flaw that at times was really annoying. Sleep drained power way too fast and battery life was inadequate. This was not a big surprise when I purchased it, but it was a little worse than I thought it would be based on the reviews and complaints. Well, here is the good news – Microsoft basically fixed it. After nearly a year, their last set of updates fixed all the problems with sleep. Think about that – all the problems. It works exactly as expected with minimal power drain even if you leave wifi on (I don’t, but I did test it). Further, I can now routinely get 5+ hours of use if using Lightroom / Photoshop with a web browser open. It used to get around 3:15 on a full charge. They even improved the power roll off where the power level would drop at a much quicker rate as the battery depleted. I can now recommend the Surface Pro 4 without reservation as long as you realize that battery life will not be like an Ipad. I don’t want to praise Microsoft too much. These issues were well known and should have been addressed prior to release. Further, it took them around 18 months to finally fix it. Hopefully, these issues will not plague the Surface Pro 5.